Perhaps the most famous songs in Pearl Jam's catalogue, "Jeremy" continues to receive enormous airplay despite being a part of PJ's oldest album, Ten. Undoubtedly, the persistent video play on MTV sparked some of the recognition, but "Jeremy" has a history beyond the saga portrayed by the often aired (and perhaps over-played) videos. The press is fond of modifying their telling of the "Jeremy" song and video story, twisting it such that Jeremy shoots his classmates perhaps thus ferreting out a more solid hook for paralleling the song to the school shootings. 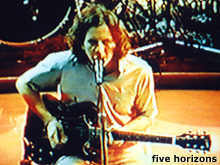 "Jeremy" has a distinctive melody that was penned by Jeff. It has always claimed a fervent crowd appeal, since nearly everyone recognizes it and gets enthused at a show when the first few notes of "Jeremy" are heard. The lyrics are easily understandable, even to a casual fan (more so than many other PJ songs) and an attentive crowd most always will raise their arms in a V appropriately and sing along, really letting loose on the "ooh, ooh, ohh" parts, when Ed will often let the audience take over, holding the microphone out to the crowd in full audience participation mode. An amusing tale surrounds PJ's live performance of "Jeremy" at the 1992 MTV Video Music Awards. Apparently the band wanted to play "Sonic Reducer." However, the "Jeremy" video was in current heavy rotation and that was what MTV demanded. The band relented, but not before playing the song off-camera as a soundcheck to the in-studio audience. Additionally, at the close of their compelling performance, Ed sings, "I don't need no ... I don't need no mom and dad ..." a sly and obscure reference to the "Sonic Reducer" lyrics. "Jeremy" has seen a few modifications and alterations since the classic, originally recorded version. The song was probably first performed acoustically at the now-legendary February 19, 1992 show at Switzerland's Albani Bar of Music, when PJ found themselves in a situation with a miniscule stage and rented acoustic instruments. 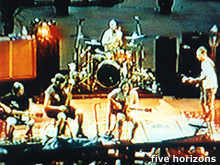 [This is one of the great "lost" Pearl Jam shows, for which a tape has never surfaced. If you were there, write us!] PJ's best known acoustic version of "Jeremy" is probably the 1992 MTV Unplugged show. Later that year, they performed the song at their first appearance at Neil Young's Bridge School Benefit November 1, 1992. But this version of "Jeremy" was a huge surprise, with a few, pensive guitar notes opening the song. The crowd was hushed, not sure what to think. This variation was almost totally rearranged with Ed filling in on rhythm guitar, a sweet bluesy riff infusing after the first verse and Jeff's pervasive bass line seems to cement it all together. Ed nearly totally abandons singing the chorus; musically, the song becomes more familiar during the chorus and toward the end. Ed notes, "... we're just making this up as we go along tonight." The written setlist seems to maintain otherwise. 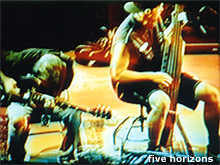 What became known to PJ fans as "the new Jeremy" was played a few more times during the 1995 tour, to the delight of many fans and to the bemusement of others, most of whom were not aware that this new version existed. Often people didn't recognize it, or at least not at first. Sometimes the band would toy with the crowd about playing it. Ed teased at the second Milwaukee show, "We're having a band argument," presumedly about which version to play. They eventually played the entire new version later that evening. If you are unfamiliar with the MP3 audio format, please visit our helper applications page, which includes specific assistance for MP3 players and downloading tips.